Like most homeowners in our area, we do not have an attic or basement for storage. Because of this our garage is a major dumping grounds for all our stuff. The problem with that is that I also use the garage as my workshop and we would like to actually park a car in there once in a while. In the past I have shared our struggle to keep it organized (and the amazing previous transformation) but since that time we have accumulated more stuff and once again, we are running out of room. Recently we went camping and I had to drag out all the coolers, sleeping bags and suitcases. The volume of space these items ALONE take up is massive. I knew I needed to add more storage! After a little research I found these Fleximount Storage Racks from Pricedepot, and they agreed to send me one to try. Everything I read about them said they were really high quality, plus offered flexible sizes. I chose a 3'x6' rack because my studs were spaced 18 inches apart and I had a large steel beam at one end of the ceiling which meant I couldn’t fit a 3’x8’. The racks also come in black or white. Mine just happened to be white. Assembling the pieces of the rack was really straight forward, but I would recommend purchasing a ratchet wrench for this project.. you will be putting on a LOT of nuts! The Fleximount racks can be adjusted to between 22 inches deep all the way up to 40 inches deep. I had to set mine at 22 since my garage ceiling was very low. The rack includes ALL THE HARDWARE. Even the lag bolts to attach the racks to the ceiling. The only thing you will need is a drill and a ladder. If you are mounting to a concrete ceiling, they ALSO include the hardware to do that. I installed my rack directly above the garage door, running parallel to the studs. 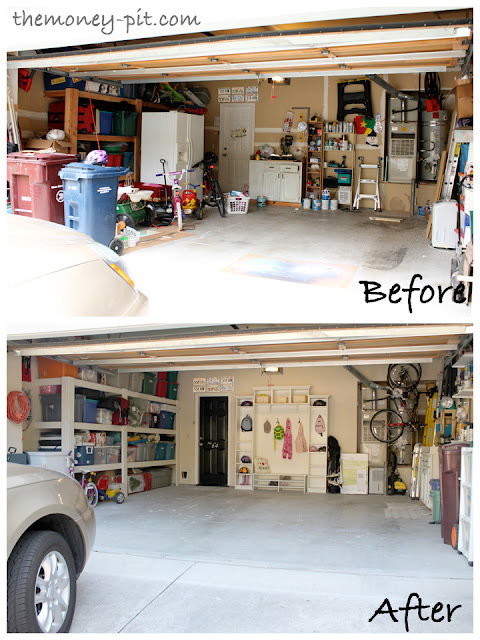 It is unused space otherwise since the garage door opens there. Technically my garage has enough room that I can add a second Fleximount rack to the other side of the door opener. It is good to know I have room to expand! The capacity of my rack was 350 pounds, so I nested all the suitcases, and put the sleeping bags inside the coolers and added it all to my rack. It is amazing just how much space I now have on the shelves where I used to store all this stuff. I couldn’t be more thrilled. The entire project could be completed in one day. Just take your time when measuring and things should go smoothly. PriceDepot sent me a rack to install for this post, however they did not influence my opinion nor tell me what to write about. This experience and review was my own.